School starts pretty soon for most of our kids. Isabella starts in the middle of August which is only a few weeks away! This summer has been crazy fast. I feel she just got out of third grade and now fourth grade is about to start. I’m excited for the new year because it’s always a fun time of year and Isabella loves going back to school. She misses her friends she doesn’t get to see in the summer. It also means we are going to be really busy as we get into a new routine and schedule. My husband has a new job and hours so I will now be doing more of the getting to school and picking up and after school stuff. It’s a good change but we will need to adjust to a new schedule. Whenever there is going to be big changes to our routine and things are going to be crazy busy, I start looking for what I can simplify and make easier. Anywhere you can save time and effort will make things less stressful and less work. Mornings and after school are always a busy time of running around and trying to get things together and get us going. So I’m all about doing what I can to help my daughter get things so she can do what she can herself. She is nine now, so she is able to do quite a bit for herself with just my guidance and reminders. She can dress herself, I help with her hair, remind her to get her bag,etc. After school we sometimes come home and need to get ready right away for an activity. If not it will be a bit of a rest and then homework. Isabella can make a few things for herself to eat both for breakfast and after school. The problem is that she never remembers exactly how to make them. She doesn’t remember how long to heat things up for and other simple directions. She only is allowed to use the toaster and microwave for herself now. We haven’t learned the oven or the stove yet. 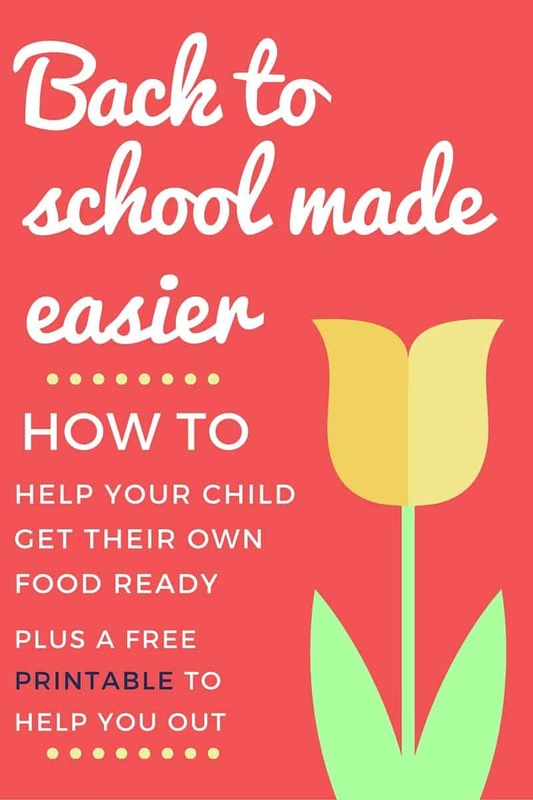 I know I’m not the only mom out there with a kid who can make their own food but can’t remember all the details so I thought of a way that will help my family and hopefully other families as well. I came up with a printable that will go on the fridge, where I can list the name of the food she wants and then next to it put the directions on how to make it. So I’ve learned you want to try out these new ideas and plans before you need them on a schedule, so we decided to give it a shot this past week to make sure it works for the school year. First we headed over to Walmart to pick up some quick easy for her to make breakfast and afterschool meal ideas. We headed to frozen foods first and got a bunch of stuff. We picked up some Tyson® Chicken Nuggets and Tyson® Any’tizers® Snacks. The appetizers are perfect for a quick mini meal between after school and an activity. Grab a few of those and some fruit and it will hold her till dinner. 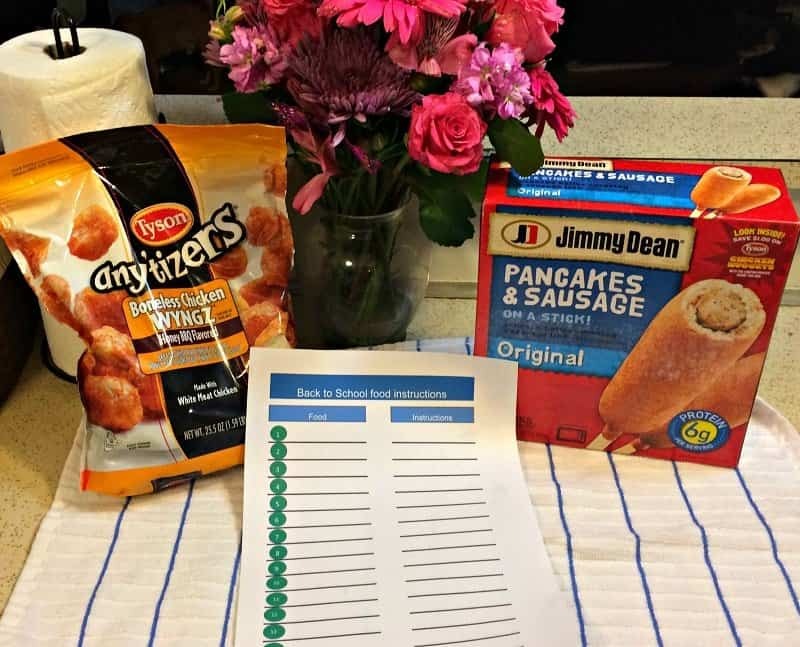 We also grabbed some easy ideas for breakfast toast, waffles and I saw these great sausage and pancake sticks she can warm up in the microwave. Here is some of what we got alongside the printable I put together. This way I can write popcorn chicken under food and the amount and time to cook. Same thing with these sausage and pancake sticks. It’s so nice to have Isabella know exactly how to put together something on her own. We have a lot of cut fruit and veggies that she can grab for snacks whenever. Plus this list can include things like how long to warm up a quesadilla, how long for a hot dog, the number of scoops of drink mix to mix with milk. All these little questions add up and I want her to learn to be able to do as much as she can. You can get your own printable by signing up at the bottom of the post. I left it pretty simple so you can add the items and instructions that work for what your family enjoys eating. My oldest starts Pre-K next week and this is great because I have been a SAHM this whole time and I will definitely need to make adjustments to my schedule and make my life easier as I am about to embark on this new adventure. It’s the little things like this that make days go by smoother! Such a smart idea! This is great for even my husband! Such a great idea! School will be starting in about a month here, so we’ll need to start getting into a routine too. My son is not quite at the stage where he can make things himself, but he can grab fruits and veggies. He love nuggets, and those are easy for me to make him in a pinch too. Great way to get into a routine!